Do not submit application documents in .zip or .rar file. 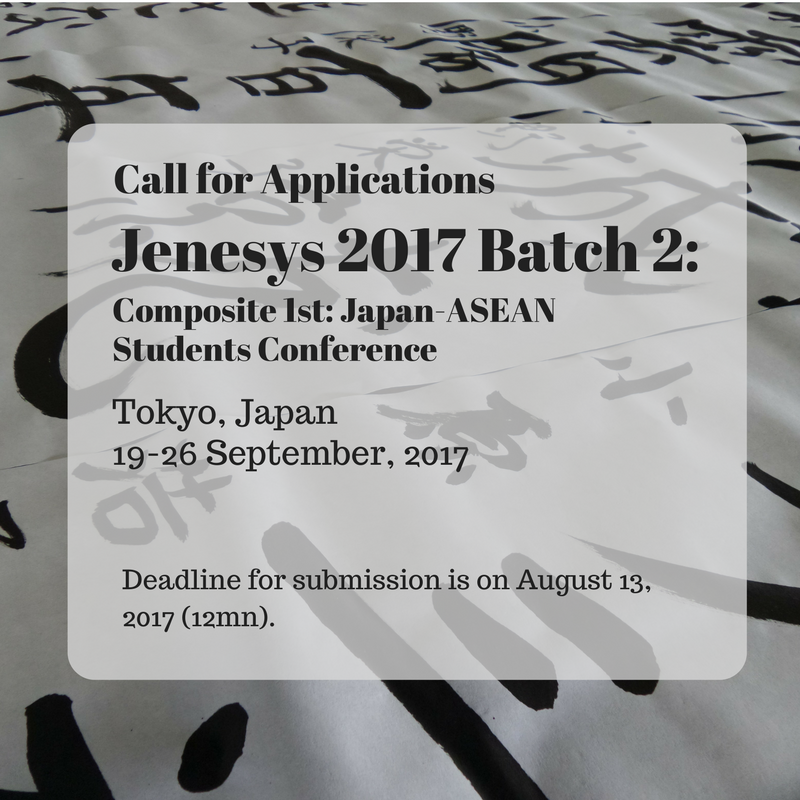 There are two ongoing JENESYS2017 call for applications. Please carefully read the instructions on how to apply. The NYC will not be responsible for lost applications or applications sent to the wrong email addresses. Please read this briefer first before asking questions. The Japanese Government, through the Japan International Cooperation Center (JICE) and the Japan Information and Cultural Center (JICC) of the Japanese Embassy in Manila, and in partnership with the National Youth Commission, is implementing the Japan-East Asia Network of Exchange for Students and Youths Program (JENESYS2017), aims at promoting mutual trust and understanding among the peoples of Japan and the Asia-Pacific region and building a basis for future friendship and cooperation. It also encourages an understanding and dissemination of Japan’s economics, society, history, diverse culture, politics and diplomatic relations. JENESYS2017 “Japan-ASEAN Students Conference” will be composed of students from ASEAN Member States (AMS) and Japan. The main objective of the Conference is “What the youth in AMS and Japan can do for Peace and Prosperity.” Participants will be divided into 4 composite groups and discuss the group theme at Workshops. The program proper is scheduled on 19-26 September, 2017 in Tokyo, Japan. NYC will be nominating 11 students. An essay of not more than 1500 words answering the following questions: A) what are your expectations about the program? B) once accepted, what do you think can you contribute to the program? C) what are your plans after you return from the program? Delegates will shoulder their travel expenses from their residence (province) to NAIA and back as well as their accommodation in Manila during the pre-departure briefing. The organizer will shoulder the delegates’ international airfare (Manila-Tokyo-Manila) and travel tax/terminal fee as well as their food, accommodation and local transportation in Japan. Participants of NYC-coordinated international programs from July 10, 2015 – present whose airfare was shouldered by the participants and whose accommodation and meals were paid by the organizer. JENESYS, KIZUNA, and SSEAYP Alumni. Alumni of all Japanese Government-sponsored (Japan Embassy, Japan Foundation, JICA, etc) scholarship, conference or cultural exchange or training programs. Applicants who have been to Japan, whether as a student, tourist or an OFW, and stayed in Japan for three months or more. Previous NYC International Programs Beneficiaries who have not submitted or accomplished the required post-program documents or volunteer work. FOR ONLINE APPLICATIONS: Submit documents to nyc.jenesyspilipinas@gmail.com (with Subject Heading: APPLICATION FOR JENESYS2017 Batch 2). Do not send application documents in .zip or .rar file. If you chose to submit online, you do not need to send or submit hard copies of your application documents. FOR PERSONAL APPLICATIONS: Submit your documents to NATIONAL YOUTH COMMISSION, THE INTERNATIONAL PROGRAMS UNIT, 3rd Floor West Insula Building, West Avenue, Quezon City, 1105. FOR SUBMISSION THRU COURIER: Send your documents to: NATIONAL YOUTH COMMISSION, THE INTERNATIONAL PROGRAMS UNIT, 3rd Floor West Insula Building, West Avenue, Quezon City, 1105. Applicants are advised to strictly follow the instructions for submission. The NYC will not be responsible for application documents which will be lost or sent to wrong e-mail addresses. Deadline for submission is 12 MN / August 13, 2017. Please send all queries to nyc.jenesyspilipinas@gmail.com with subject heading “Query: JENESYS2017 Batch 2”. Please get in touch with the NYC International Programs Secretariat through Ms Sarah Grutas or Mr. Mark Fernandez at telephone numbers (02) 4268733. The NYC reserves the right not to respond to questions whose answers are already stated in this briefer or in the application form.